This all natural, homeopathic medicine offers kids relief from the uncomfortable symptoms of the common cold - from sneezing and sore throat to runny eyes, runny nose and headache. 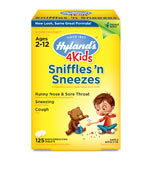 Sniffles 'n Sneezes 4 Kids is formulated especially for children ages 2-12, with an active ingredient proven to shorten the duration of colds by nearly half. An all-natural, homeopathic medicine that relieves symptoms of the common cold, including sneezing, sore throat, runny eyes, runny nose and headaches. Zincum Gluconicum, one of the active ingredients in Sniffles 'n Sneezes, has been clinically proven to shorten the duration of a cold by nearly half. Effective and free of pseudoephedrine acetaminophen. Safe to take without side effects or interactions with other drugs. Specially formulated for kids 2-12 years. Quick dissolving tablets melt like magic.